In this SlOkam, ALavandhAr looks at the attainable ISvara‘s distinguished nature, and his own previous state, and thinks “How can I, a samsAri (worldly person) desire for the kainkaryam which is too far for the minds of brahmA, rudhra et al and is desired by nithyasUris who are untouched by material aspects? How can royal food become touched by poison!” and condemns himself as done by nammAzhwAr in “vazhavEzhulgu“. paramapurusha – Oh purushOththama (supreme lord)! Oh purushOththama! I who is popularly known to act according to (my own) whims and fancies, should condemn myself who is impure, not reformed, merciless and shamless yet desiring for service to you which is very far to even think for those brahmA, Siva, sanaka et al who are considered as foremost among the best yOgis. aSuchim – Me who is connected to the material body since time immemorial. nithyaSudhdha (those who are eternally pure) are those who have had no connection with material body ever. avinItham – Since I have not done any service towards an AchArya who will help me realize that this body is the cause for impurity, I am not reformed. nirdhayam – Like nectar is countered with poison, me who ignored the distinguished bhagavath vishayam (matters relating to bhagavAn) and tried to counter it. alajjam – Shameless me for not even knowing that it is laughable for me to trying to approach bhagavAn like a bawd (woman incharge of brothel) tries to engage with the emperor. mAm dhik – ALavandhAr is condemning himself for having these inauspicious qualities. 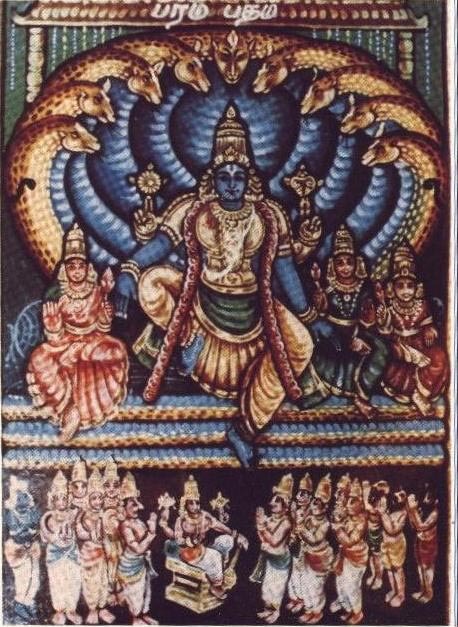 paramapurusha – Oh supreme lord of all! yO’ham – Me who is best known as the worst of fallen persons. yOgi varya … – brahmA, Siva et al who are the foremost among the best yOgis, sanaka et al who are brahma bhAva nishta (fully focussed on emperumAn) – even for these, that which is too far to even think about. thava parijana bhAvam – The kainkaryAmrutham (nectar of performing service) to your highness who is the lord of all and most enjoyable; I desired for that which is performed by the nithyasUris (eternally free souls) who sustain themselves by their attachment to bhagavAn and who are distinguished themselves. kAmayE – Did I stop with just having the attachment? I am at a state where I cannot bear myself anymore without it. I called out saying “kadhA nu sAkshAthkaravANi” and “kadhA praharshayishyAmi“. kAma vruththa: – Me who did whatever I desired like a person attached to sensual pleasures will do anything without checking if it can be done or not. Desire will not see one’s nature [I am also doing this without knowing my own nature]. This entry was posted in Other, sthOthra rathnam on February 7, 2017 by Sarathy Thothathri.